UPDATED: Students at Scappoose High School will see a new face around campus starting next week — one that has golden-brown fur, a pink-and-black collar, and enjoys chew toys: Finley — the school's new therapy dog. 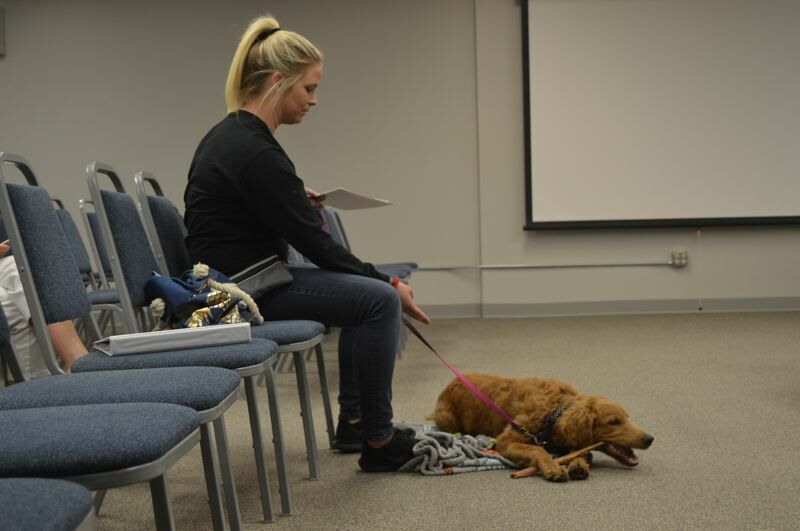 Whitney Scott, a counselor at the high school, approached school staff last school year to propose the idea of bringing in a trained therapy dog as a way to address the emotional needs of some students. During the 2016-17 school year, Scott said the counseling department conducted a student needs assessment and found that a variety of students wanted to speak with a counselor during the school year, and about 5 percent of students expressed interest in participating in a peer group to discuss anxiety control. An even greater number of students with individualized learning plans, known as 504 plans, have anxiety and depression disorders, Scott explained. She wanted to help address the needs of those students by developing the therapy dog program. Through online research, she discovered a variety of educators and counselors using therapy animals in school settings. Scott pitched the idea that she would adopt and train her own dog, a Goldendoodle puppy, as an emotional support and therapy animal, and eventually bring the dog to school to be used as a tool in her work with students. "I love animals and have personally felt the benefit of dogs on my emotional well-being. I was able to find data that supports my experiences," Scott said in an email to the Spotlight. "In my 11 years of school counseling experience, I have witnessed a large increase in students experiencing anxiety and depression. I felt like a therapy dog would fit in really well with our student body. It is a creative idea that is gaining popularity in schools and is being researched more." While the therapy program may be new to the Scappoose School District, it's not a new concept in Columbia County schools. In the Vernonia School District, K-6 school counselor David Spackman has been using a therapy dog in the schools for almost five years. His first trained dog, Teddy Bear, was a golden retriever. Two years ago, Teddy Bear passed away, but students and staff took it upon themselves to fund-raise close to $1,000 for Spackman to get a new dog. like having an extra arm for me in my work." This year, Topper, a two-year old golden retriever named after the Vernonia Middle School mascot, joined Spackman at school. In Rainier, the elementary school principal also has a trained therapy dog that has been on campus for three years now, said Superintendent Michael Carter. 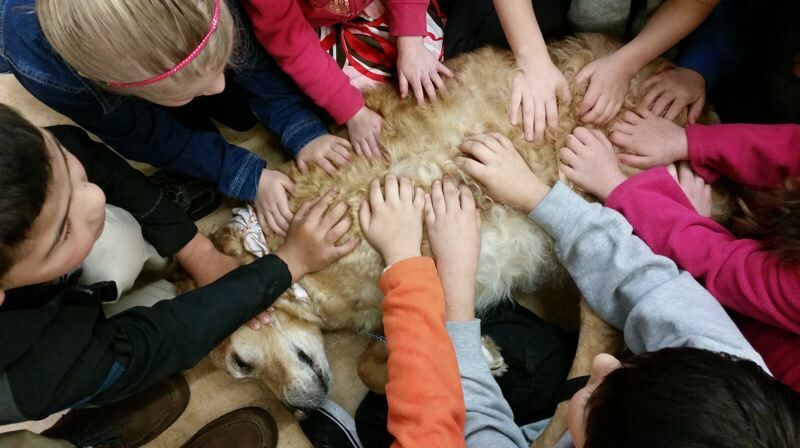 The benefits of having the animal in the school go beyond a morale boost, staff noted. Vernonia's Spackman said that children can't always articulate how they feel when they're emotionally escalated. "When a kid is troubled, we want to get them regulated and get them on track." he said. "For some kids it's not talking. It's about movement and, for some, it's about having a cuddly animal to pet." Scott and Finely have been participating in training programs with the Petsmarrt puppy training programs over the summer. Finely is expected to pass her immediate level of training from on Sunday, Sept. 30. If that goes well, Scott plans to bring the dog in twice a week for a half-day on Tuesdays and Thursdays. After Finley turns one, Scott will put her into training with the American Kennel Club's Canine Good Citizen program as well as the Pet Partner's Animal-Assisted Therapy (AAT) Training Program, which goes beyond the AKC standards. Service animals differ from emotional support and therapy animals, Scott noted. Service animals obtain certifications to perform specific tasks for an individual, according to definitions outlined by the Americans with Disabilities Act. Therapy and emotional support animals serve a different function and require permission from the superintendent, according to the district's policy. Scott is expected to report back to the school board at the end of the semester to talk about how Finley is working in the school. "The students have appeared to be very excited to have Finley at SHS! Finley has an instagram account @itsyourgirlfinley and lots of our students follow her progress. In our counseling guidance lessons, we (the counselors) have been introducing Finley and letting students know what they can do if they are not comfortable being around a dog. I want to be very respectful of students that are not interested in getting to know her," Scott added in her email. Editor's note: This story has been updated to correctly indetify the training programs Scott and Finley have completed and plan to take in the future. The Spotlight regrets the error.